I’ve logged well over a million steps since February and for the first few months the FitBit never left my body. Day and night it was working. In the day It logged my activity and at night my inactivity. I soon got bored of clipping it onto the little sweatband that was required if you sleep in the buff and want to monitor your sleep patterns. Besides, once you had two months of evidence that you weren’t sleeping enough, why punish yourself. Like many, I can easily gauge my ‘Sleep Efficiency’ by how knackered I am when I wake up. If I was going to strive to sleep more the FitBit would be perfect. When it comes to sleep though, I’m just not that dedicated. I say it would be ‘perfect’ but as there are a few more alternatives out there now, if I was really going to take the logging of my personal data seriously I’d probably take another look at devices that can be worn easier or charge without the use of a weird dongle. The Nike Fuelband is one but not being a fan of Nike I have ignored it. There have been triumphs with the FitBit. When I felt like I needed to lose some weight I used an app called ‘My Fitness Pal‘ to log my calorific intake and it synced it’s data seamlessly with the FitBit and it’s site. Both sites also allow you to compare data with people in your network. It worked, it really did. Having an app telling me what I could eat and a device that aided me in walking it off was really handy. Everything became a game. I would walk an extra lap of the block with the dog as I knew I would build up enough calorie credits to grab a beer from the pub on the way home. The Dog loved it too. But even that novelty wore off. 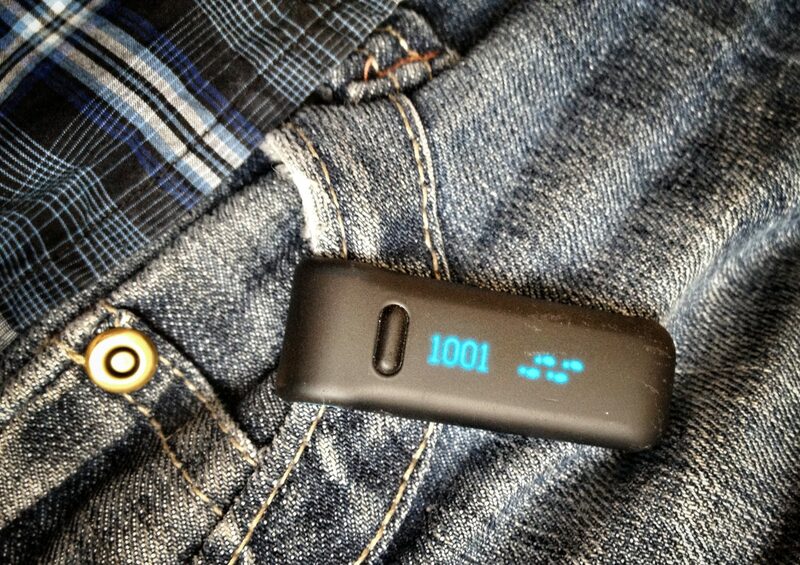 I do try to do my 10,000 steps a day but almost as soon as I got the FitBit I suffered a Hernia. (Unconnected I’m sure.) I just had the hernia operated on and now strangely I’m finding the data I collect on a daily basis interesting again. Looking back on the last week it’s obvious when the operation rendered me useless. I had to spend the first day in bed. But then, mainly through feeling like I was going stir crazy, I’ve been moving more and more. I want my return to full mobility to be steady and natural, so far it has. I can now see by my stats the comfortable rate for me to re-train myself back to fitness. Especially easy at the moment as training is just walking. I know I bought it as a bit of a gimmick to start with. Even so, I religiously clip it to my side every morning. It’s little OLED screen flashing a message of welcome as it’s picked up. One thing is certain. I am finding the FitBit useful again. Not because I want to do anything with the data. Sometimes I just want reassurance that I’ve had a busy day. Sometimes the number on the device will be the dice I roll to tell me if I finish the bottle or not. It just really nice having this kind of personal information to hand. It’s just a glorified pedometer really. One that also measures stairs and awards me badges when I reach milestones. It’s awkward to charge but that’s ok as the battery lasts ages. It’s only got one button but as soon as it’s clipped on I forget about it. I can’t wait to see what the next generation of this device has to offer. I shan’t get carried away with the tech though. 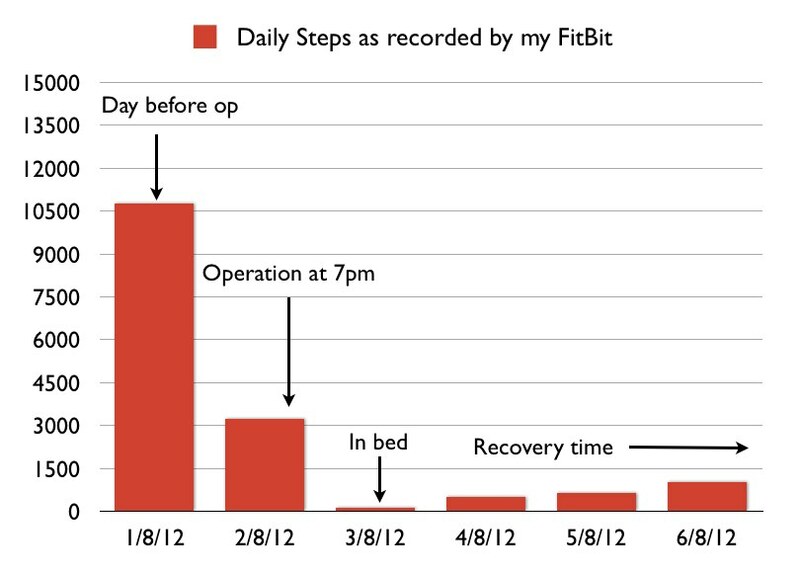 I may like my FitBit, but it’s the data I love. On the 15th of September 2012 my FitBit somehow dropped off my belt and was ran over. 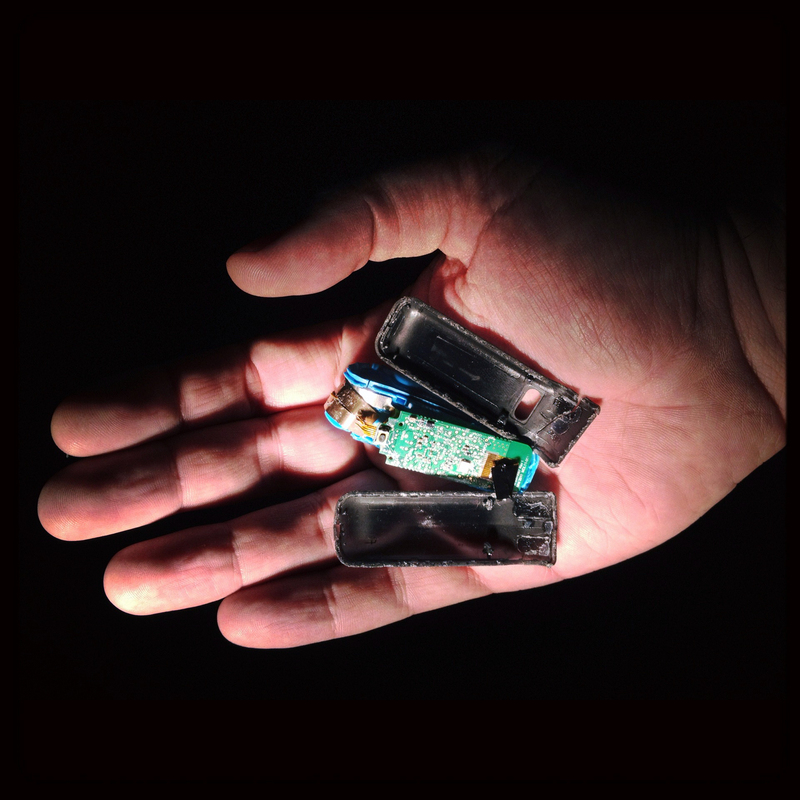 I noticed it was missing late one evening and retraced my steps to find it crushed like a bug in the middle of the road. After mentioning it on twitter @Tinnion told me that customer service for FitBit was pretty good and they sometimes replace them free of charge. I emailed them and that is just what they did. There was a week of zero data in my FitBit account but I could live with that considering i had a free replacement and was soon back in business. And now of course there are updates.. I like the idea of a wireless sync. Way more convenient. Has my FitBit usage changed since losing one? Yes. I tend to drop it in the little watch pocket in my jeans now and forget about it till i sync and charge. That data you love is definitely a “story trigger”. Wondering which kind of stories we, our selfs, will make out of this kind of data, unfinished stories really, in the future. As info visualization, connection with other devices and apps improve they will tell a better story for us on a bigger screen. I hope I don´t forget thought it´s just a representation of reality. What a small world this is. I was researching whether to buy one of these and my googling brings me back here!! I work as a hgv driver and am currently doing shunting duties in the depot yard. This is a very physical job as I am constantly getting on and off the tug to secure the trailers I move. Up to 4 times per trailer movement. Multiply this by an average of 60 trailers moved in a 12 hour shift and you can see I am considerably more active than I was 2 years ago. I am looking for something to log all this activity plus all the climbing on and off the tug which is pretty high off the ground!! The only thing I need to find now is a device that can log my swimming activities as I am doing them. I don’t believe this is waterproof. Anybody know of a device that is? Then to find a way to assimilate all this data from various devices so that I can get a bigger picture of my activities.